3for5 Blog: Help 3for5 Give 500 People Clean Water! 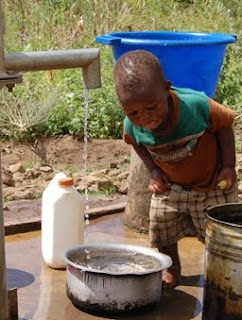 Help 3for5 Give 500 People Clean Water! This is our vision for the future: that millions of people across the developing world would be able to gain access to safe, clean water for the very first time! To that end, we aim to raise $10,000 by New Year's Day to help fund our first water project and provide water to more than 500 people in Malawi. It's ambitious, but with your help we can get there. If you haven't already done so, consider donating $5 for clean water via 3for5.org. Every $5 means something incredible for people without clean water. At the same time, invite 3 friends to join 3for5 with you, and be sure to follow-up with them in a personal way (via phone, email, or in-person) to make sure they have received your invitation. Last but not least, thank-you for being a part of 3for5--together, we can have incredible impact! p.s. -- as always, click here to download the 3for5 Friends Handout and give it to your friends when you talk to them. (http://www.3for5.org/docs/3for5_Friends_Handout.pdf).